Our team will help you enhance your exposure over the internet by incorporating Social Media into your online marketing strategic plan. UBIELIFE is often asked to help small businesses get set up on various social networking platforms (e.g. a Facebook Page, Twitter, LinkedIn Company Profile, Wechat, and etc…). To get you started, we can create and configure the accounts for you with the required photos, links and information about your business, and then hand them over to you to use (and we can also assist you after setup — your choice). We are here to help. 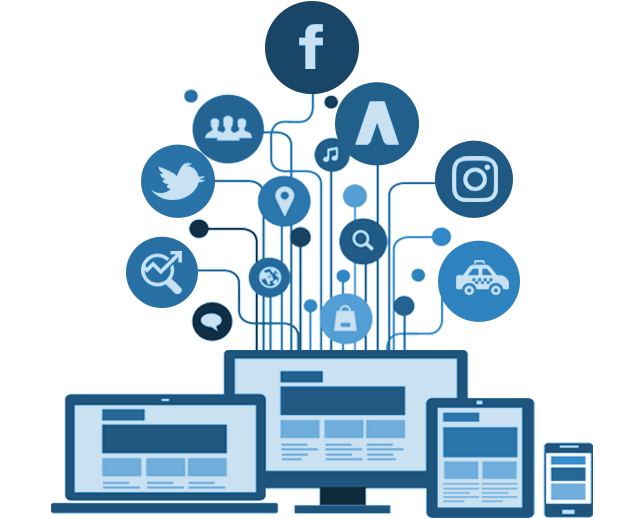 Each business has different requirements; however, our Social Media Account Creation services include most of the top social media platforms and can be customized depending on your needs. Want to talk? Call us today! Creating social media accounts is the easiest part. The question is, how can you make your page stand out and take the advantages of free media? Another problem is, who’s gonna maintain your account and keep your subscriber and customers updated? We at UBIELIFE have experienced those dilemmas before. We are proud to say, we have solutions for that and we’ve got you covered. 24/7 Support. We are always here whenever you need us. Can’t think of what to post to your timeline? We’ve got a solution for that. Our full-service, in-house team of content producers can create images, contents, and video promotions whenever you need it. We know you. We know your brand, products, and services. We live and breathe digital, and our Marketing Team will learn and understand your brand from the start of our very first collaboration together. PS: We will experience your services and try your products beforehand. We can do everything. We will do and try every possible way to boost your business visibility. Yeah, we’ve got your back! We don’t call it full-service for anything. Think of us as an extended arm of your business for social content.h! Give your customers and viewers the best viewing experience possible! At home, at the office, on vacation or wherever they happen to be, give them around-the-clock access to your business events through a live and high-speed video streaming. UBIELIFE can provide you with the best Live Streaming experience through Social Media Networks. Low Latency. We understand that the delay between broadcast and consumption by the viewer needs to be as low as possible. Which is why we pride ourselves on being able to provide super low latency live streams. Mobile Compatibility. Give all your viewers the same consistent experience. Our mobile phone and tablet support means you no longer have to treat certain viewers as second rate citizens. Together, we can deliver a massively successful live stream. Call us today! Do you know who your audience is? It may change for the program or service or communication you’re sending, but you need to have a clear understanding of who needs to know what you’re saying. Once you’ve clearly defined your target audience, then you can focus on what needs to be said, and how it is communicated. Don’t fall for the “Tell everyone” trap. Already have a database? UBIELIFE can provide social media audience database management to your consumer file to help you get the most out of your current customers and influence who you prospect for in the future. From consumer demographics and behaviour to lifestyle segmentation and channel preference data campaigns that perform start with a clear picture of their target audience. Millions of search queries and clicks are happening per seconds on Facebook and other social media networking sites. Posting products and services advertisements between those time have great potential. The Facebook and Youtube Ads are good examples. Imagine, flashing your products and services in front of million viewers. Wow!, potential customers right at your fingertips. That’s how we do Social Media Ads Campaign at UBIELIFE. We are here to help you to take the advantages and make efficient ads. Contact us for more information!